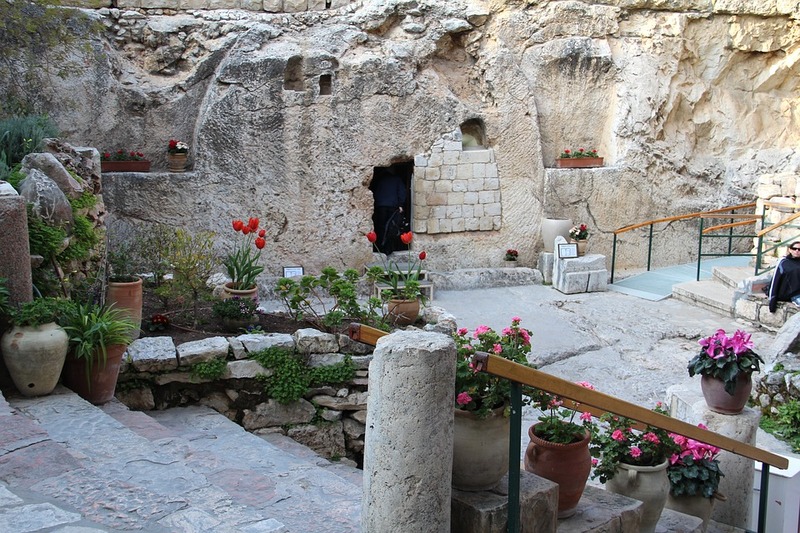 Jesus’ Burial Place: The Garden Tomb or the Church of the Holy Sepulchre? What do you think of when you think of Jesus’s burial place? What images come to mind? Is it a large stone covering a hole in the rock wall with an armed guard standing beside it? Is it Mary Magdalene arriving at the tomb with the stone rolled away? Is it a quiet place? What does the “garden” look like? As Holy Week and Easter approach we read the account of Jesus’s death and burial: “They took the body of Jesus and wrapped it with the spices in linen cloths, according to the burial custom of the Jews. Now there was a garden in the place where he was crucified, and in the garden there was a new tomb in which no one had ever been laid” (John 19:40-41). Two possible locations have been suggested for the burial place of Jesus in Jerusalem: the Garden Tomb and the Church of the Holy Sepulchre (the traditional site since the fourth century). The Garden Tomb, discovered in 1867, is a beautifully landscaped garden with paths and benches where one may sit and contemplate Jesus’s death and resurrection. As you walk toward the tomb, you can see the stone moved aside and the door to the tomb standing open. You can almost picture the disciples running toward the tomb, seeing the stone moved away from the door, and then imagine Peter bursting through the door to find the tomb empty! Although the Garden Tomb is not the traditional site of Jesus’s burial and resurrection, and although many archaeologists and scholars agree that it is not the actual location (see the links below for the reasons why), it is the kind of setting where one would want the location to be. Whether this is the actual site or the Church of the Holy Sepulchre is the actual site, or some other location is the actual site is not important. “For our sake He was crucified under Pontius Pilate; He suffered death and was buried. On the third day He rose again in accordance with the Scriptures; He ascended into heaven and is seated at the right hand of the Father” (The Nicene Creed).